When the sun rose this morning over the Worst Company In America Salvage Yard, awakening Rusty the lazy junkyard dog who couldn’t scare off a squirrel, four battered, bruised, nauseated, and bed-headed contenders greeted the dawn in contemplative silence, knowing that two of them would be gone by sundown. In their hearts, they hoped to survive the day while the doubting devils whispering in their ears reminded them that a loss could bring sweet relief, an end to the ceaseless brutality of the last few weeks; a victory just meant one more brawl. Now, as we cart the defeated off the battlefield, we leave behind one tournament vet and one WCIA rookie to prepare for Monday’s Final Death Match. A wave of voters came out to support SeaWorld (which recently blamed a drop in attendance not on negative publicity, but on bad weather) in its quest for a WCIA title, but it just wasn’t big enough to drown out the rage-filled cries of Comcast voters who want to return the Golden Poo to Philadelphia, where Comcast could display it in a place of pride inside the new skyscraper it’s building, for the first time since 2010. 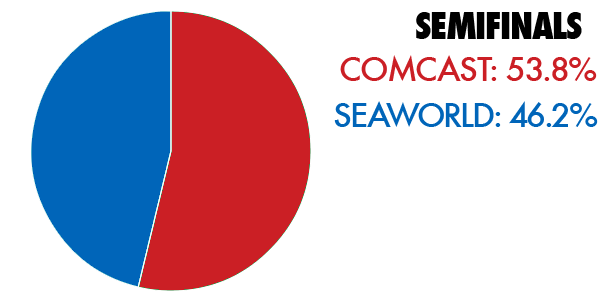 SeaWorld was really the first contender to even come close to upsetting Comcast, which hadn’t given up more than 30% of the vote any of the three previous rounds. Being rookie in the WCIA tournament is no handicap. A number of first-timers have taken home the Golden Poo, most recently in 2011 and 2012, when BP and EA each came out victorious in their bracket debuts. And after today’s Semifinal fight, lawsuit-loving seed company Monsanto has the chance to add to that list of victorious newcomers. 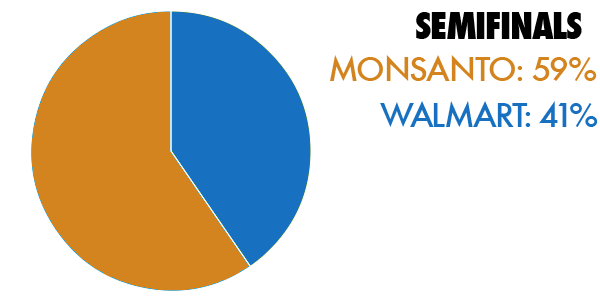 Monsanto has not been on the winning side of any out-and-out blowouts in this year’s tournament, but all of its victories have been decisive, demonstrating a steady level of hatred from Consumerist voters. Today was no different, with Monsanto worsting Walmart, which was fresh off a surprise upset of Bank of America in the Quarterfinals. But will Monsanto haters come out to support the company they think is most deserving of the Poo? Or is this just Comcast’s year? We’ll find out when WCIA Final Death Match voting opens Monday morning at 10 a.m. ET! !